Ambala city tourism will take you to a cherished expedition of Indian history and will also deluge you into a religious and spiritual journey. The fact that makes Ambala a distinctive destination for tourists is that Ambala presents you a unique combination of spirituality and history. Although, at present, Ambala is not such a singled out tourist place but there is immense potential for the city to develop its tourism industry. Notwithstanding whether or not Ambala recognizes its tourism potential, here we present you some of the landmark places in the city of Ambala and also the different facilities that tourists get to have the benefit of in Ambala. As pointed out previously, Ambala has very gaping assignation with the history of India ad is home to some of the important historical monuments. Given here are the details about few historical landmarks in Ambala that have today become one of the prominent tourist spots of the city. Kos Minar is an important piece of architecture related to the Mughal Period. It is situated on the Grand Trunk Road near the Cloth Market in Ambala. Kos Minar was constructed by Sher Shah Suri, the great Mughal Emperor, Around 400 years back. The main purpose of constructing this tower was to use it as a landmark between places. 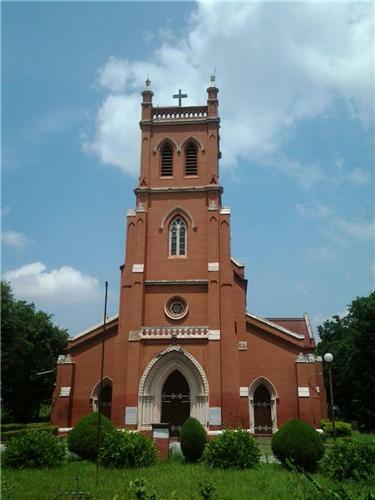 The Holy Redeemer Church is a classic example of the Gothic style of architecture built in 1905 by the Britishers. It was built about 100 years and is still maintained very well. The grand church is well known for its marble pavements, strong pillars, glass windows, huge tower and high Victorian style roof. Rani Ka Talaab is another important tourist attraction in the city of Ambala. This historic place was constructed around 400 years ago by King Ranjit Singh. It is located near Ambala Cantt and is under the supervision of the army. Ambala city has a number of historical landmarks that catch the attention of the tourists. Below are the details of some of the prominent religious destinations of Ambala. Ambika Devi Temple is one of the oldest temples of the city and is dedicated to Goddess Bhawani Ambika. It is believed that it was constructed by the Pandavas during the Mahabharat war. The temple suffered many attacks at the hands of the Mughals but was later rebuilt by the Hindus. Located near the District Courts Complex, this Gurudwara is dedicated to Guru Gobind Singh. It was built by Sardar Mehar Singh of Nishanwali. These are the popular Muslim shrines in the city of Ambala. Though not very giant, yet the mosque conveys message of culture and peace. A large number of tourists come here every year and express their belief and faith. Apart from housing important historical and religious landmarks, Ambala cit also has many other tourist places. These include Ambala Planetarium, Guru Gobind Singh Library, Labhu Ka Talaab, Mahavir Park, Navrang Rai Sarovar, Paget Park and many more. There is no such best time to visit the city but avoid coming here during extreme summers and extreme winters. You can plan your trip any time from September to April. Also, visiting during the monsoon season isn’t a bad idea in fact. Here are some important telephone numbers of police stations in case you are stuck up in an emergeny in Ambala. Always remember to keep these numbers handy with you in order to save yourself from any sort of hassle.